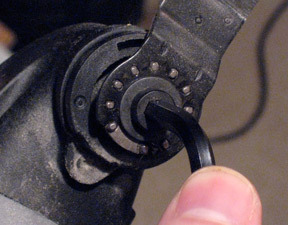 Updated 4/2011: Lots of manufacturers are beginning to offer their own oscillating multi-tool. We’ve been able to review the Rockwell Sonicrafter and it proves to be stiff competition for the Multi-Max. Check out both reviews before making your final descision. 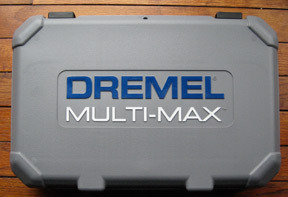 The Dremel Multi-Max (official site) is a departure from the typical rotary tools that Dremel is known for. This oscillating tool is designed to tackle a wide variety of projects like cutting wood, metal, and drywall, sanding, scraping and even grout removal. It’s a handy tool for the professional and DIYer. The good: This really is a multi-function tool that performs for lots of different projects. The Multi-Max weighs less than 2 pounds and the ergonomic grip is comfortable to hold. The small form-factor makes it easy to work in tight spaces. The bad: The Multi-Max is limited to small stock- the deepest cuts are 1 ¼” and sanding pads are small. Some accessories sold separately. Overall: Dremel backs up their claims. The Multi-Max is versatile but also very precise. A great tool to have at hand. The Multi-Max features an oscillating head that moves 1.5° left and right (3° total) at a variable speed ranging from 10,000 – 21,000 OPM. There’s a seperate On/Off switch that allows you to maintain the speed setting. It’s powered by a 1.5 amp motor and weighs 1.9 pounds. There are a total of 6 cutting blades designed to cut through wood, metal, drywall, plastics and other soft materials. It has a maximum cut depth of 1 ¼” depending on accessory. Most of the blades are flush cut style capable of making plunge cuts. Cutting through pine (a relatively soft wood) was quick and effortless. What really impressed me was how easy it was to control the Multi-Max. The blade didn’t jump around as I began cutting and I moved along with ease and precision. Sanding with the Multi-Max is a simple process. Each piece of sandpaper has backing that attaches to the hook & loop (velcro) pad accessory making it easy to switch sandpaper grits. I was concerned that the hook & loop pad wouldn’t really secure the sandpaper, but didn’t find any problems after sanding some plywood. The Multi-Max is ideal for sanding edges, corners and small areas. The sandpaper comes in an innovative “triangular” shape that allows you to access corners and other tough-to-sand places. There are several grits to choose from. Sandpaper is available in 60, 120, and 240 grits for wood and 80, 120, and 240 grits for removing paint and varnish. The Multi-Max is also capable of grinding thinset, cement, mortar, plaster and wood. There are two accessories for grinding. The 60 grit Diamond paper is used with the hook & loop pad while the 24 grit carbide rasp is a standalone attachment. There are two scraper accessories available. 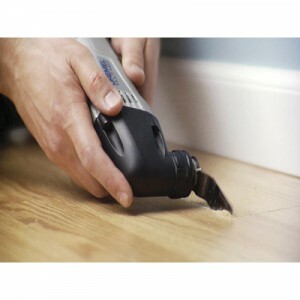 The rigid scraper is 1-9/16″ wide and intended for removing vinyl, varnish, paint layers and carpet. The flexible scraper is 1-3/16″ wide and used to remove caulk, adhesive and other soft materials. If you are looking to remove grout (but not the tile), this tool is a must-have. The two grout removal blades measure 1/8″ and 1/16″ wide. The Multi-Max boasts the Quick Fit system for fast accessory changes. Here’s what that means. 1: Using the hex key provided, loosen the set screw until the accessory can be removed. 2: Place the new accessory onto the holder, fitting into the semi-circle of pins. Changing accessories is pretty quick but does require a hex key. Also, some accessories (like the hook & loop pad) require you to fully remove the set screw, not just loosen it. There are several different kits available, each with their own set of accessories. Expect to pay around $100-$150 from Amazon, Home Depot, Lowes, or any other home improvement store that carries Dremel tools. You’ll also see combo kits with the Dremel Multi-Max and other Dremel tools in the $200+ range. What do you think? What projects have you tackled with the Multi-Max? My husband and I bought the Multi-Max right after our first home purchase for the many projects we would be tackling. It’s been one of the best decisions we’ve ever made. We’ve cut wood, sanded doors, cut a metal threshold and even used it to cut trim to fit in a new floor. It’s really a great buy and our go-to tool for so many projects. It’s lightweight and very comfortable to hold. My only disappointment was that Lowe’s doesn’t carry any of the accessories in store. You have to special order them. We purchased ours at Home Depot where you can purchase the extra accessories in-store. Ethan, Amy, Glad to know this tool is as good as they claim. There are two other competitor’s products we know of – one from Rockwell (the Sonicrafter), and the other from Craftsman. My dad got the latter for Christmas and we’re hopefully going to give you a review of it soon. It’s almost hard to believe that such a great tool was just invented. It’s a relatively “simple” concept but makes a lot of sense in practice. After much consideration, I got the Multi Max version from Harbor Freight Tools (approx $40) There was much debate in the family as a few of them consider it cheap Chinese junk. But I only needed it for a few things so chose that over Dremel. Love using this tool! I’ve used it to undercut door frames so I could install laminate. I also used it to carve out about 4″ of cement for a cable….destroyed the blade but worked great! I’ve also used it to remove the bottom of 2 cabinets that were ruined due to leaks. So I already got my $40 worth. I’m trying to look for other stuff to use it on…it’s fun to use! This product is junk! Burnt threw 3 of these at work and then got my money back. I will never buy anything from this company again. Like the tool! Used it to lightly sand the mag chloride off my chrome wheels. Made them nicer than they were!